Divide onion slices and cucumbers into jars. Stir sugar, vinegar, mustard seeds, celery seeds, turmeric, and salt in a bowl until sugar and salt have dissolved; pour the pickling syrup over the onion and cucumber slices. Cover jars with lids and refrigerate for 1 week before opening. This is the recipe my mother uses and it is so good. I don't even like pickles but I like this! It is that good. Super easy and delicious. Did not wait the full week to eat them because we like them a little more crunchy. Waited only 3 days and they were perfect. This is my go-to recipe for quick pickling. I modified it to 1c. vinegar and 1/2 c. sugar. It really cuts the sweetness, and lets the other spices shine through. 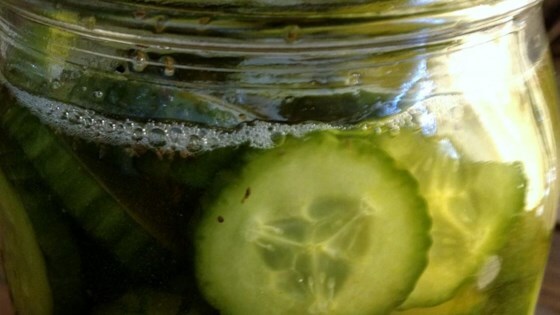 These are the first pickles I ever made. They are all gone. I will make more tomorrow with my remaining cukes. Easy, yummy, great accent to a meal. Thanks!